Sabyasachi’s new drool worthy wedding collection is the answer to all your wedding outfit & jewellery questions! Sabyasachi just gave the most breathtaking feed to all his Instagram followers with the launch of his latest wedding collection, ‘Kesribai Pannalal’, and we just CANNOT KEEP CALM! The drop dead gorgeous collection by the brides’ most preferred designer has the answer to all your wedding questions- you just name it- jewellery, lehenga or whatever! Even the men are also seen sharing the spotlight!! This timeless collection takes you to the era where the traditional practices were flourishing high. Sabyasachi, who is known for his evergreen elegance presents hand embroidered couture with charismatic radiant jewellery !! Let me take you to a journey where the time stands still and only elegance prevails! 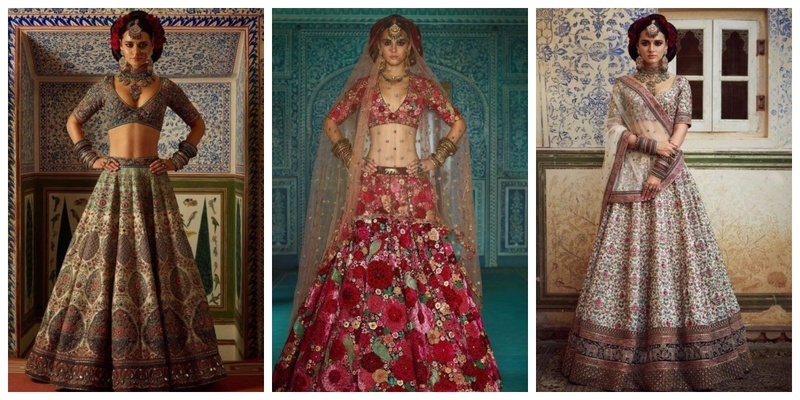 The lehengas shown here are lavishly hand-embroidered with silk-floss, beaten silver thread and studded with semi-precious stones, beads and pearls. Loving this moss green silk lehenga embroidered with silk-floss thread, beaten gold bullion and semi-precious stones. The groom is seen wearing a lotus jade khadi sherwani, lavishly embroidered with burnt gold zardosi. Ever seen a work so intricate like that? A baroque jacket in ivory and Iranian turquoise silk is first hand-painted, then appliquéd with tea-dyed velvet and over-layered with the finest of zardosi, coffee-stained pearls, rhinestones, crystals and semi-precious stones. It is lined with chintz-printed cotton and over-layered on top of a voluminous cotton lehenga. This couture-meets-Bohemian-whimsy ensemble is paired with a stunning vintage choker in uncut diamonds and tourmalines. The lehenga is intricately embroidered on Bordeaux silk with hand-dyed velvet appliques, silk-floss, beaten silver and gold thread and rose-tinted crystals and rhinestones. The look is accessorized with jewellery from the Sabyasachi Heritage Jewelry Collection and romanticized with a sheer, diaphanous, embroidered veil completing the look of a traditional Indian bride! The ladies are wearing shawl-collar velvet portrait blouses with zardosi detail and hand-painted and printed organza sarees with vintage borders. Their necks are adorned with dainty necklaces made out of emeralds, diamonds, rose-cuts and natural pearls. From winter 2018, the Sabyasachi menswear line introduces a new house classic- their own quilted silk sherwani in hand-dyed Murshidabad silk accessorized with hand-crafted Bengal tiger buttons. Grooms, gear up, your favourite are not too far! The lady on the left wears a silk mashru kurta, embroidered with ‘tilla’ bel-butti and border, chowki design aari-taari dupatta and a mashru gharara with ‘tilla’ details. While the lady on the right is wearing, distinct aari-taari saree with gota or zardosi border. A flamboyant men’s printed cotton angrakha in rose-madder coromandel chintz. Sabyasachi presents Burma Ivory velvet saree with a painstakingly embroidered ‘tilla’ work pallu inspired from a rare Kashmiri shawl. The pleats are embroidered on tulle with marori and gota. The look is accessorized with 22k gold, uncut diamonds, emerald and pearl jewellery from the Sabyasachi Heritage Jewelry Collection. the Sabyasachi menswear line introduces a new house classic- our quilted silk Nehru jacket in hand-dyed Murshidabad silk and accessorized with hand-crafted Bengal tiger buttons. Inspired by Mughal miniatures and Benarasi meena, this lavish lehenga is embroidered with silk floss, antique zardosi and semi-precious stones and pearls. The lehenga is framed with a museum-quality zardosi border featuring elephants and foliage with three-dimensional relief. For a little bit of period whimsy, the lehenga is teamed with a shawl-collar portrait velvet blouse in ‘Sulekha’ blue. The look is accessorized with traditional jewellery featuring Burmese rubies, Zambian emeralds, pearls and uncut diamonds. The Sabyasachi collection takes you on to a Nostalgic journey with every collection that is launched! No wonder our brides’ preference and trust stick to the god of elegant wedding trousseau! Have you finalised yours yet?